I am thrilled to be featured today on the fabulous Kelly Latevola's Monday Blog Series--Caseing Genius. She is the GENIUS who through this series showcases and creates fabulous CASE's of other cardmakers cards in her gorgeous colorful style. I have been stalking following her blog ever since I first saw her work through this very same feature of a blogging friend of mine. From that day on...if Kelly posted, I made a point to visit. If you are not familiar with her please hop on over you won't be sorry. I am beyond honored and excited to see what she's done, so join me in heading over to Kelly Latevola's blog Your and Your Big Dreams to check it out! Thank you Kelly, so much, for including me in this series. I had one more frame left from the set Greta sent me. This time I colored up the frame with some Inka Gold paste in silver and added some silver embossed trees and snowflakes inside the frame from a Stampin Up set. 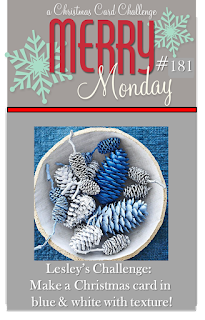 The challenge at Merry Monday 181 is to use blue and white with texture. My dear blogging friend Greta sent me these Simon Says Stamp Merry Christmas die cuts (thanks so much!). I have been pondering how I was going to use them, and upon seeing the Merry Monday challenge, I knew exactly what I wanted to do. I stamped the tree scene in versamark and heat embossed with white powder. This image from the Stampin Up set Happy Scenes is the perfect size for this die cut frame. I added the little twine and bow to finish the card off. I love the simple and clean lines. I even had to make a second one in red I liked the design so much. I love these little pilgrim mice from Lawn Fawn. The last of my cards for the night, its about to strike midnight and my bed beckons. 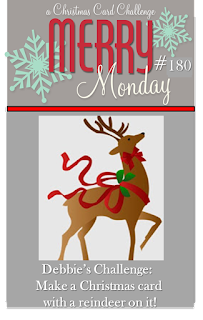 Merry Monday's theme is to use a reindeer. I recently acquired the adorable Winter Friends set by Clearly Besotted and there is a darling deer with a big nose included. He makes me smile. I hope you smile too! Thanks for stopping by. More of the Mondo Poinsettia set from Essentials by Ellen, and the sentiment is from CTHM. I was looking through my challenge list and quickly got this card made. 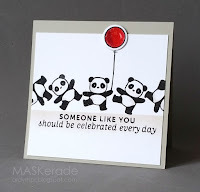 The challenge closes in a few hours and I don't like missing one of Leslie's monthly sketch challenges over at The Crooked Stamper. Here is the Sketch for Challenge # 10. I started with dies from Essentials By Ellen--Merry and Bright and Home and Hearth. I spread some Inka Gold paste in silver onto a piece of card stock. This stuff dries incredibly fast, and I love the shine. I cut the houses, trees and stars with the die set. Next I cut my sentiment words from some red scrap paper. I masked off the center portion of the card and inked it with some Tumbled Glass distress ink. Once that dried, I adhered my die cuts. I hope to get a few more cards made tonight, but for now its off to the kitchen to make dinner! I took these picture quickly with my point and shoot, I didn't realize they were so wonky...I can correct that with my phone but have no clue how to in my pc photo editing soft ware...so sorry! I mailed them outlast week I cannot retake the photos. Stamps by Newton's Nook - Exclusive for Simon Says Stamptember 2015. Love the images, and all those fun leaves. Tonight after taking care of a few chores I sat down to tackle my last homework for the Online Card Class Holiday Style. The lesson is for soft and subtle cards. I admit to tearing up 4 tries...none of them even got to the sentiment stage and none were re-purposable. This card, started as a oh what the heck...what would this look like...and I loved it. The stamps sets are Ellen's Mondo Poinsettia, and Simon's Big Scripty Greetings Holiday. Ranger's platinum embossing powder and two colored pencils one in Vermillion and one in Lemon Yellow. They are my neglected Artist's Loft pencils and had nice sharp tips. After stamping and embossing my images, I simply stroked on color very lightly at the inner and outer petals (leaves) of the poinsettia. No blending, just soft strokes of color. I embossed the greeting, and added a toss of clear/silvery sequins. So, what do you think? Did I achieve soft and or subtle? After getting the wild idea to reorganize my craft space last Friday, its been nothing but emptying, sorting, discarding, cleaning, putting away, building, putting away, and I am tired! I had to take a break finally I was even glad to do LAUNDRY...can you imagine? So tonight I am putting it on hold and catching up my homework for the latest offering over at Online Card Classes. I have 3 cards for two more lesson days. I had no "Santa" stamps until I picked up this set by Clearly Besotted, and all the images are adorable. Copic coloring a bit of drifty inking and I put white flower soft on his had and coat, gossy accents on his boots and belt. This card should be fun to hold for the recipient. The next two cards are glittery...traditional and paste. I have had trouble in the past die cutting using the double sided tape, but this time I put it on copier paper and die cut down through the release paper, since I wanted to add glitter, worked like a charm cut clean easily. I used the fabulous glitter ritz micro-fine glitter for the greeting, some wink of stella and glossy accents on the holly berries and mounted it all on a woodgrained cardstock panel. There is a bit of grey and white dotted paper as a grounding element. The die is from Avery Elle. This is the second time I have gotten out the gold bo bunny glitter paste. I love the look of it using the Tim Holtz stencil. I mounted the panel on a white card base and added the black sentiment strip, sentiment by CTMH. That's it I am caught up on homework. Have a fabulous day, and thanks for stopping by. I've spent the weekend reorganizing my crafting space...and it is a much bigger job than I anticipated. Apparently I am very creative at finding nooks and crannies to shove store things in. I am adding a couple of small shelving units and hubs has removed the 30 boxes he had stored in this room! Yea! But I seem to have crammed in so much stuff it it is like working a slide puzzle to get things into place. It will take weeks to get all the fine tuning done. I thought I would share my wood block storage. It is a nail polish rack which hangs on the wall. Each shelf is about an inch and a half wide and 24 inches long. The space between shelves is about 5 or so inches. I've put on display my most favorite stamps and have consolidated 5 shoe boxed sizes boxes to two plus the wall. Storage plus decoration...that is win win. I have not had a bit of crafting space to create anything, but hope to clear space by Monday night. Thanks so much for stopping by! Over last weekend I found out I was one of the lucky randomly drawn winners of a blog hop. The prize I won was donated by Darnell, and I wanted to send her a thank you for donating the prize which ended up in my happy hands. I spent most of last weekend playing with Clearly Besotted's Giving Thanks stamp set, and I loved the sunflower option. I started with the wheelbarrow, added the flowers and masked that all off. I used the Hero Arts Large Lotus stencil with some scattered straw distress ink across the whole panel in a light to dark inking. The image was colored with copic makers. The sentiment was stamped with versfine vintage sepia ink. The card base is from Stampin up and the sequins are from A Muse -- each of the 4 mm sequins packets is a mix of light medium and dark shades of the color chosen. I liked that that matched my inking. Today's lesson over at Online Card Classes' Holiday Style was Classic and Elegant cards. An example of fabulous poinsettias by Debby Hughes was by far my inspiration for today's homework. There were die cut outlines, flower petals and gold glitter die cuts all put together as only Debby can do. I do love white on white, and I am in the midst of reorganizing my crafty space so finding my gold glitter proved impossible. I did find some iridescent glitter and a piece of paper I had covered with some Viva Inka Gold. The Simon Says Stamp sentiment was die cut from the gold coated paper, and the Snowflake ornaments are from Memory Box. The right most ornament has the open spaces filled with the iridescent glitter. As a finishing touch I drew lines in for the ornaments with a gold wink of stella ball point and added some white marshmallow and clear sequins by Pretty Pink Posh. My final touch was to round the two right corners. Have you started your Christmas cards yet? I missed a few of the Online Card Classes this year due to travel. So I was happy to sign up for the current one Holiday Style. The first day's lesson was clean and simple cards, and the instructors were fabulous. I made 3 cards in each of the styles of today's lessons. I did not use the same, stamps or dies but rather dug through my collection for something that would work for a similar style and design. I do like the format for this class. Lessons and videos on day one, inspirations on day two highlighting the lesson. I have always enjoyed the classes, and it looks like this one will be no different. A while back I was quite taken with this card by Michele Ferguson. I told her so, and that I would likely case it before the year was out. Well I did, but I had to add some color to it. I was also taken with Jennifer McGuire's Faux Textured Metal Post. So this is a mash up of the two. I made two cards, one is going to Michele and the other to my MIL. Thanks for stopping by! 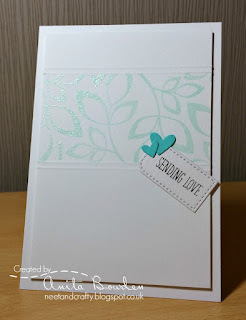 Supplies: Darice Embossing Folder(Thanks again Greta! ), Perfect Pearls, Lawn fawn Dies, Distress Inks. I bought this stamp set for the apples. Yes I know it is not cost effective to buy a set for one stamp only. Turns out I have already made several cards with the set and it has year round possibilities. Yea! The set is Clearly Besotted's Giving Thanks. This is my second card with the apples. The main panel is mostly one layer, with the sentiment strip added. The apples are covered with some pico embellisher in clear so there is a nice tactile feel to the card. The "leaves" are stenciled with multiple colors of distress inks. The clouds were created using distress ink over a hand cut mask. I have a new stamp set and I have been playing with it all weekend. The main portion of the set is a wheelbarrow. 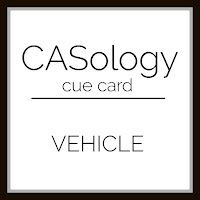 I am calling it my vehicle for a pile of gifts this week and am entering it to CASology. 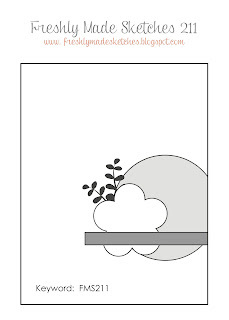 Her narrative indicates that the flower shape and the leaves are guidelines only. I think my wheelbarrow and apples satisfy that guideline. This image is from Clearly Besotted and is called Giving Thanks. Images were stamped with versafine and colored with Zig clean color pens. I created masks for the image and the circle negative. The background of the circle is sponged distress ink in Broken China. My sentiment is produced on my laptop as I had nothing that fit! The card looked a bit plain(yes I have white-space issues), so I literally tossed a few sequins around the circle, loved the places they ended up and glued them down. I am sending this to a friend I have lost a bit of touch with this summer, and so will be entering it to Jennifer McGuire's Share Handmade Kindness challenge for family and friends this week. I knew I wanted to do something mostly in black and white, but also something graphic and fairly clean. I couldn't help myself from adding a matting layer, but I am very happy with the results. I've used Penny Black's Seasons Wishes and I replaced the stamped star with an epoxy one, which was colored with copic's and some wink of stella. The image was clear embossed over onyx black versafine ink. My misty came in very handy for this project. I used WPlus9's Pretty Peonys and the sentiment comes from PTI- Big Hugs. The die cut frame is from MFT. The front panel and the flowered panel are both attached on fun foam, the frame is flat mounted to the card base. I used watercolor paper and mounted it all on a Wplus9 oatmeal card base. Small SU pearls were colored with coordinating copic markers. Inks were Distress for the water coloring, and Versafine for the black and gray sentiments. The last one is my favorite, which one do you prefer? Thanks for stopping by. I have been a bit mojo-less the last few weeks. I had my Halloween cards made early and didn't post them until after they'd been mailed and received. So for two weeks I haven't done much. I have had a few crafty get togethers, but I am not getting cards done. I've got stuff started...but nothing finished. Today while checking in on Facebook, I found I had forgotten a birthday (so not like me) and the man I worked for before retiring recently had surgery and I thought a card might cheer him up. I am a night owl and consequently my days rarely get going until after noontime. After I had made lunch for hubs and I, I had about 3 hours to get the cards made and into the mail. 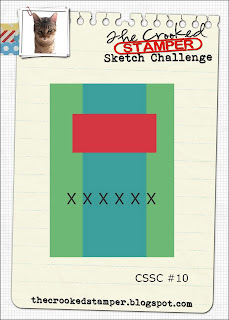 For the first card, I used the Mojo Monday Sketch #422 and it fit perfectly with the theme from Cardz for Guyz Challenge # 95 Hope you feel better soon . The tall wheat stamp is from Hero arts, the feel better is from Close to my Heart. The pale woodgrain papers are a gift from blogging friend Michele (thank you!!). The sentiment is heat embossed on vellum and layed on top of a same sized circle of the wood grain. They as well as the grasses panel are popped up with dimensionals. I love this set by mama elephant, its called unforgettable. The sentiment reads "you are absolutely unforgettable, it's your birthday that's hard to remember". Well thanks to my faulty memory, I was able to use it for the perfect card. The image was colored with copics. The little party had was masked and the balloon is popped up and glittered with some wos. Some enamel dots and a little enamel heart and this one was done.